This Bruce American Home 5/16 in. Thick x 12 in. Wide x 12 in. 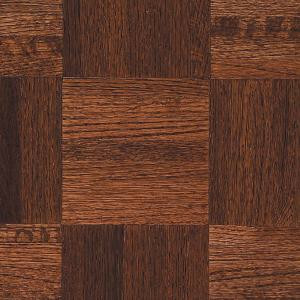 Length Cherry Oak Parquet Hardwood Flooring features a pre-finished medium spice brown oak with a high-gloss finish. This flooring will add warmth to your room that will compliment many styles. This solid oak parquet flooring offers a squared edge for easy, glue-down installation for your convenience.